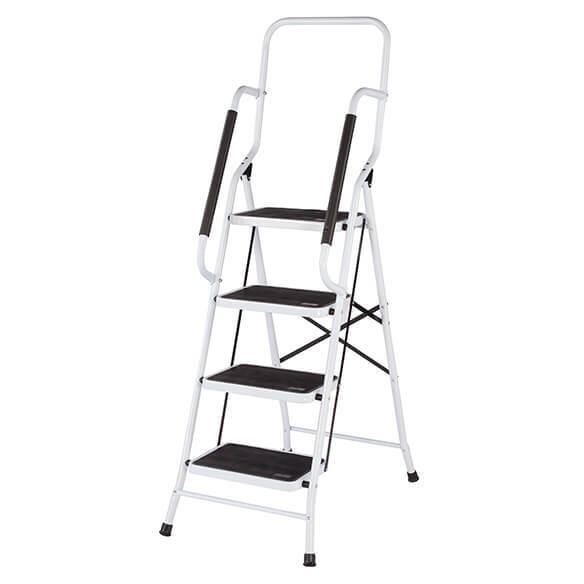 Folding four-step ladder with handrails takes safety to a higher level. 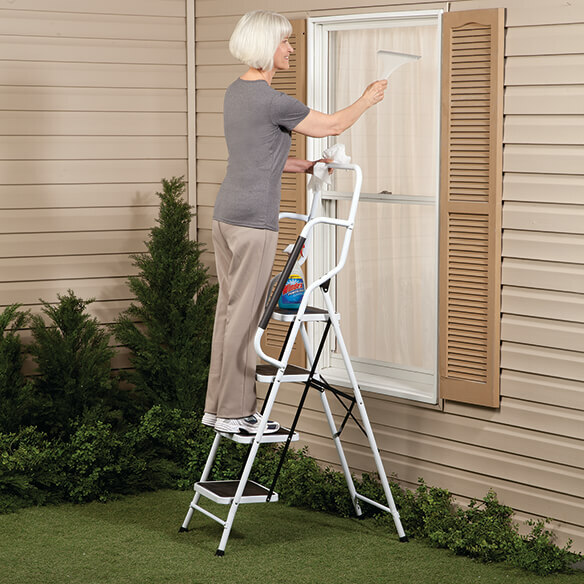 Folding step ladder features sturdy handrails and extra-wide steps with non-slip treads. Perfect for decorating or cleaning hard-to-reach areas. Space-saving design folds flat for easy transport and storage. Folding ladder supports up to 300 lbs. 32”L x 21”W x 66”H overall. 38" maximum standing height. Steps measure 10 1/4”L x 15”W. Steps are 9 1/2” apart and off the floor. Note: This item is not eligible for additional discounts at the order level. A very well built ladder with extra safety features. It is a little heavy but necessary for the durability safety aspects of the ladder. Miraculous! Every household needs this! Has given me back my independence to safely reach areas of my home I would otherwise be waiting for assistance. Yes, it is a bit cumbersome and heavy, but that is because it is well constructed! I used it to put up curtain rods and curtains. Love my new four step ladder. I would suggest this item to friends and family. I have a height problem, so this ladder is perfect for me. easy to change my A/C ceiling filter. I like my new ladder very much, but it is heavy and it might be a good idea to know that going in. I am in good health and fairly strong, and at an age where the extra security of the side bars is desirable. I am not sure that I will always be able to lift and move it. This is the best step ladder that I have ever used. I am an older lady and this makes me feel very secure when I need to change a light bulb, or put items away on high shelves etc. Nothing that is not great about it! needed something that was taller than a stepstool but not overly tall. the handrails are great, and knowing it can hold the extra weight is wonderful. Only problem we had was that the delivery people dragged the box and lost part of the hardware (nuts and bolts) but you can get those at the hardware store. Great product and a great price. I looked a long time for a ladder that would give me the safety and stability I need. This is great! The handles make it safe when climbing high. It is very secure and takes the fear of ladders away. This ladder is the best purchase I have made in a long time. So glad to have it in my home. Wonderful product. You feel safe and secure up on this step ladder. Dust ceiling fans, change bulbs, clean windows and hang curtains to name a few tasks you can complete. Extremely happy with my purchase. We have many storage boxes for the holidays stored on shelving in the garage up to the ceiling. We love this ladder. It is safe and very sturdy. My husband is 70 years old and weighs 215 pounds. He feels very safe on this ladder. It has handles to help us keep our balance. It was just what we were looking for. We like it so much, we are going to get one for each of our kids homes. Best & sturdiest stepladder I've ever had. Great ladder! Even my wife feels it's safer. done so this fills the bill! Because of a back problem, getting on a conventional step ladder was a problem. The handles on this step ladder are sturdy and extremely helpful getting the job done. Overall, the step-ladder is VERY sturdy. The only drawback is that it is a little on the heavy side to carry around. Having the hand rails makes me feel more safe when climbing. Opens up the tall world for me. As an81 year old, 5'1' senior, I have found myself limited. Always aware of the danger of falls, I couldn't go very high on a step stool or ladder. The first time I used it, I could not believe that I had actually climbed that high without fear. Wish I had found this sooner. I use this ladder constantly around the house to reach items up high, also to hang things on the walls, watering hanging plants on the patio. Feel very safe and secure. I bought this ladder for washing the windows in my house. It works great. The hand rails are very handy. The top step is 40" high. This step stool allows me to reach the areas that I wouldn't feel safe using most other step stools or ladders. The handrails and wider steps are GREAT and are what sets it apart from others. Definitely worth the money! I think this is great product. I used it to change lights, clean my ceiling fans and change lights outside on the porch. One thing that was very hard for me to do before without falling off a little step ladder. I do safety on my job so I know how important this product is to everyone. I have no issues with the ladder. Can do odd jobs around the house as I feel safe on ladder with handles. Put my mind at peace with ceiling lights, etc. I first used my four wide step ladder to change out ceiling lights without any problem the ladder didn't shake or made me feel as if I would fall off. The ladder made me feel safe and I got the job done in no time. I also used the ladder to get my cabinets which were to high to reach without a ladder again I got this chore done without any problem in just a few minutes due to the ladder being so safe to work on. The best! Haven't seen anything like it or that compares to it. NOTE that it does have a 300 lb limit though. Received the ladder in a timely manner. It was well packaged and I was pleased with the quality. So much easier to move around than my older ladder, plus it is a step higher and has the great handrails. I have wanted this ladder for a while and am totally happy with the purchase and now my mother is getting one too. This is such a helpful piece of Equipment. I haven't used it enough yet but I can see it being very useful in many ways. This is the perfect for us as we need that extra stabilization that the hand rails provide. This ladder was a great investment. I am in my 60's. My head, and eyes say I can still do a back flip, but my body says I can't. I remember when my aunt was this age, and broke her foot on the second step of a regular ladder, and decided to invest in something stronger, and sturdier as a gift for myself. Use to reach high shelves in closet and in kitchen and to wash large windows. Compact enough to take on RV trips. I have been looking at similar ladders for a while and was glad when I found this one on sale. I feel much more secure than when I used my old step ladder to get small jobs done around the house..
A MUST, especially for "the older folk"
I am so happy to finally get this SAFE ladder! Recently lost my husband, who was my "reach for items in high places" helper, so i knew i needed something sturdy and safe in order to do things myself now. Haven't actually tried it yet, but i think it will work great-- and I love knowing that there are handles on the sides and at the top to help me navigate. I am very excited about that safe ladder. I was able to do so many things in the house and in the garden. I am not a chicken of the year and I have a serious problem with my left arm (titanium plate) but the bionic woman feels very independent. I emailed many of my mature friends (males & females) with the ladder picture to make them happy and safe. I recieved this step ladder in perfect condition, I haven't installed the rails yet, therefore I haven't gotten on it. Light weight structure for hobbiest. Worried about long term usage sturdiness. Rods support seem flimsy for painting. Item is sturdy when set. It is a little heavy for my wife to lift. A suggested improvement, make the steps a little wider. Suggest you put the weight of this item in the description on your website. If I had known it was so heavy, I might not have bought it. Also, it needs a flip down shelf at the top to sit things on while you're using it, which it doesn't have. Otherwise I like it OK.
Way too heavy.......only used it once. The ladder/step stool is what we wanted. He is kinda wobbly and the hand rails work well so now he can work on ceiling fans, relate light bulbs and etc without thinking he is going to fall. He also puts a belt around himself and through the hand rails to help him feel secure. Thanks a lot. I have problems with my knees so this ladder was great because I could climb "with ease" if there's such a thing for a 78 year old. My biggest complaint is that with its weight why lockable wheels were not put on either the back or front legs. I have great difficulty carrying a 50 lb ladder. It almost made me fall by putting me off balance. I don't know who makes up your quality control staff but they missed the boat with this one. This item arrived with quite a few rust areas on it. Very disappointed in the paint job. Each rusty area is several inches long. Seems sturdy enough but the steps could be aligned better. They feel like they're on top of one another and not spread out like most stepstools. Hand rails are very nice. A good addition to the ladder especially since the steps are built as if they're pretty much underneath one another. It will take some getting used to and some paint to touch up the rust. Considering the price and the extra shipping amount, I would have liked the ladder to be in perfect shape. Even though this feels very sturdy and we find the handrails to be very helpful, the stairs don't feel aligned as well as they should. More of a ladder feel to it then the spread out feel of a step stool. Very bothersome was the extremely poor paint job. Many areas of our step stool had extensive rust showing through. I'm not talking dots of rust - these areas are all several inches long. We'll definitely need to buy a good spray paint and cover them before they become any worse. Do not stand on top step. losing your balance is a real possibility. I would recommend standing on third step, using top step to hold items? I am a small, older woman and was really looking forward to having this ladder; however, I neglected to find out---and don't see this info anywhere---how much it weighed. I do not have room to keep it in the house, and there's no way I can drag or carry it back and forth between the house and the garage. Too much hassle to return it, so I'll have to find someone else who can use it. So disappointed! The ladder is dangerous for an older person or someone who needs a hand rail to get up ladder. To easy to lose balance coming down ladder. Needs someone to supervise will on ladder. I bought for my mother. She likes to be independent , she is a do it yourselfer. She wanted the handrails so she could thinks off the higher shelves and cleaning around the ceiling. Someone has to hold the ladder while going up and down,so the ladder does not tip. I do not feel that this step ladder is as sturdy as claimed. I weigh about 135 and it is ok for me but my husband is about 215 and I thought it was going to collapse when he got on it. i would not let him on it again. I used it to put in a new light fixture and my husband stayed right by the ladder to make sure I was secure. The steps don't go up at an angle to make going up comfortable, instead each step is almost at the same distance out from the frame as the one below. I was looking for a strong step ladder that I could use when having to change light bulbs and other chores in hard to reach spaces. Appears safer than the one we currently use. Appreciate the handrails. 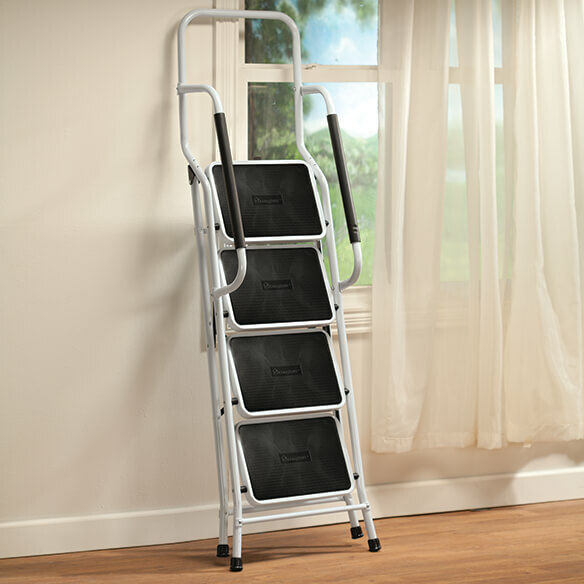 I read the customer reviews concerning this ladder and the reviews were positive. cleaning indoor windows, changing bulbs, cleaning fans. Handles for safety and stability. and was very glad that she did. So here I am. Looks like it is easier to use, more steady and safer to use. My mom wanted a step ladder with hand rails. Fans in home need cleaning, and other areas are to high to reach. Perfect size for the taller areas in the home. Being a senior, I needed to be secure, and trying to stay independent. I had purchased the smaller one and was very pleased. With this one I can change light bulbs and smoke det batteries. like the side rails too. I have been looking for a supportive ladder with wide steps as I have size 13 feet. This is the first ladder I have found with the height, step support, and safety to support a 6 feet 2 inch tall made who is portly at 69 years old. change light bulbs in my home! A friend has one that we was able to see and it was just what my wife needed to have. I have balance issues and can't use regular step stools without the handrails and bar at top. Great photo and explanation of it. Looks like just what we need! 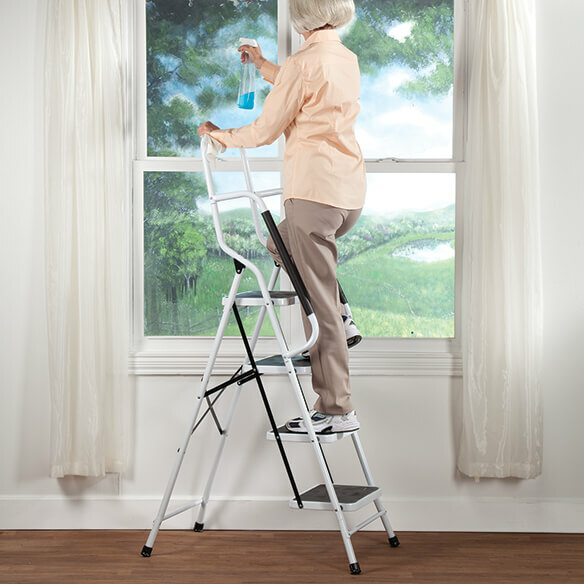 Safety for elderly relative who likes to stand on top step of two-step ladder! Hope to change her habits. Need something stable to change curtains, batteries in smoke detectors, change light bulbs, etc. I read some of the reviewers comments and felt that this step ladder would work for me. Thank you! I need a lightweight ladder for in-house use. Needed a safer step ladder to reach shelves. To help me reach closet top shelves. Why wasn't my code used? Need like this, with extra holding on room. Elderly wife with Epilepsy is safer. does the 10 percent come off the 79.99 for new customers for this item? BEST ANSWER: Thank you for your question. If you have a special source/promotion code then it will apply to the product when ordering. We hope this information will be of help to you. BEST ANSWER: It is steel and painted and it is VERY sturdy. , with this ladder, I will be able to rich the home ceiling from the upper 4 step? FROM THE FLOOR TO THE TOP OF THE FOURTH STEP IS 38"
Does this ladder arrive fully assembled? What does the 32"L dim refer to? Is the 21"W dim from left to right as you face the front of the steps? BEST ANSWER: Perhaps they are referring to the length of the base of the ladder when it is opened being the 32” measurement, and the 21” width of the steps including the hand rails. I haven't run out with my measuring tape and measured it, but those measurements seem correct for this step ladder. Thank you for your question. Height from floor to top of the handrails is 54". The steps measure 10 1/2" x 15" x 1 1/4". We hope this information will be of help to you. Overview says that it is 66" H. Your answer says it is 54" H. Does this mean that it is 66" H when closed for storage & 54" H when open for use? BEST ANSWER: Thank you for your question. This is made of metal. We hope this information will be of help to you. How high will this get me if I am 63" tall? BEST ANSWER: I’m also 63” tall. I can climb to the 3rd step because of the handrails and reach my top cupboards so I’m guessing 7 1/2 to 8 ft and feel comfortable. Higher if you’re in great shape. What is the height of the rise (from floor to 1st step; from step to step)? BEST ANSWER: Thank you for your question. There is 9 1/2" between the steps and the floor. We hope this information will be of help to you. How is the highest step? BEST ANSWER: Thank you for your question. Height from floor to top step: 38 ¼”. We hope this information will be of help to you. How much does the ladder weigh? BEST ANSWER: Thank you for your question. The ladder weighs 26.85 lbs. We hope this information will be of help to you. Overview says that the ladder's overall height is 66" H. Your Staff answer to Annette B. says it is 54" H. Does this mean that it is 66" H when closed for storage & 54" H when open for use? BEST ANSWER: Thank you for your question. The overall height is 66" from floor to the very top when folded up. It is 54" from floor to handrails (the second bar, not the top). We hope this information will be of help to you. Do you have a wheel kit to make dragging it easier? BEST ANSWER: Thank you for your question. We do not have a wheel kit. We hope this information will be of help to you. Do you have a wheel kit to make moving it easier? BEST ANSWER: Thank you for your question. No, we do not have a wheel kit. We hope this information will be of help to you. Does this ladder truly hold up to 300 lbs.? We purchased one that looks very similar that in the advertisement stated it held up to 330 lbs and when it arrived the assembly instructions stated it held up to 225 lbs. We definitely need it to hold 300lbs. BEST ANSWER: Thank you for your question. The instructions state the weigh limit is 330 pounds. We hope this information will be of help to you. What is the length, width, and depth when folded for storage? BEST ANSWER: Thank you for your question. The dimensions when folded are 64” x 8½” x 18”. We hope this information will be of help to you. What is the weight limit to climb on this ladder? BEST ANSWER: Thank you for your question. The Step ladder holds up to 300 lbs. We hope this information will be of help to you. How much weight will it hold? what is the ladder's weight & how high is the top step from the ground? BEST ANSWER: Thank you for your question. It is 26.85 pounds and the top step is 38 1/4" inches from the floor. We hope this information will be of help to you. How much does this ladder weigh? BEST ANSWER: Thank you for your question. It is 26.85 pounds. We hope this information will be of help to you. how much does this four step ladder weigh? BEST ANSWER: Thank you for your question. This weighs 26.85 pounds. We hope this information will be of help to you.